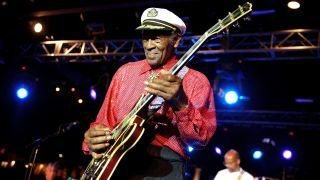 Pioneering guitarist, singer and songwriter Chuck Berry has died at the age of 90, it's been confirmed. The rock 'n' roll icon, who had been due to release a new album this year, was found unresponsive at lunchtime on Saturday, police in Missouri have said. Berry scored a string of hits in the '50s, including Maybellene, Roll Over Beethoven, Rock and Roll Music and Johnny B Goode. Crossing racial lines with his fusion of country and blues, his groundbreaking songwriting inspired a multitude of up-and-coming musicians on both sides of the Atlantic. He was also rock 'n' roll’s first guitar hero frontman, bringing a new level of showmanship to his performances.